The Global Call for Proposals (GCP) seeks to match SAI capacity development proposals with donor or INTOSAI funding. It empowers SAIs in developing countries to drive forward their capacity and performance by ensuring proposals are SAI-led and aligned with the SAI’s strategic plans. Tier 1 is an inclusive approach, accepting proposals from all SAIs, INTOSAI bodies and regions for initiatives benefitting SAIs in developing countries which are then circulated amongst International Donors and INTOSAI Partners for funding possibilities. All organisations that match the criteria below are eligible to submit applications to the Global Call for Proposals Tier 1. Under Tier 1, the GCP involves seven key steps from initial concept note to applicants and partners working together to develop projects. This is illustrated below. The process description is available in English, French, Arabic and Spanish. 3.Feedback: Based on the finding of the review, the Secretariat provides feedback to the applicant on the concept note until it is considered final. I.e. 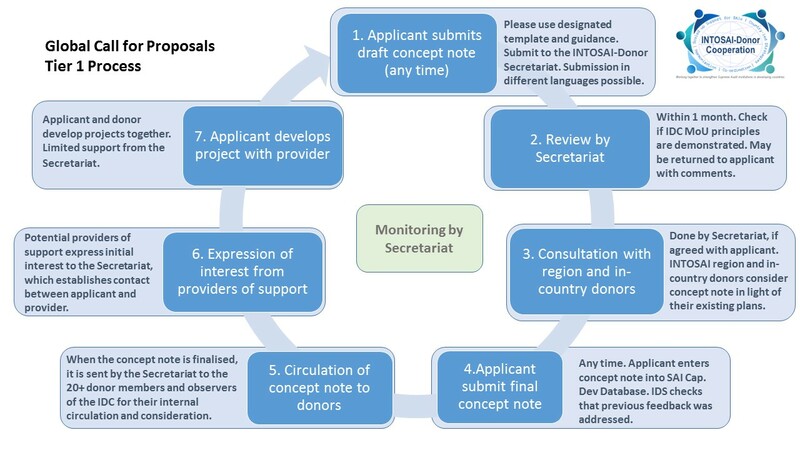 steps 1-3 may form a cyclical process of drafting, reviewing, consulting and strengthening concept notes until the Secretariat is satisfied that the requested support cannot be met by in-country donors and INTOSAI regions, and the MoU principles are properly followed. 4.Consultation with INTOSAI-regional bodies and in-country donors: to enhance coordination, it is important that concept notes are discussed first with the SAI’s existing partners, including INTOSAI regional bodies and in-country donors. This will be arranged by the INTOSAI-Donor Secretariat, once the concept note is sufficiently well developed (as per step 2a above). The purpose of this is to ensure that the requested support reflects an additional need over and above current support and to explore whether it can be accommodated within existing or planned support programs, including regional initiatives. In cases where the applicant does not want to request support from existing donor(s) it may specify this in its concept note. The existing donor(s) will be notified of the SAI’s intention to apply for funding from a new donor or provider of support. The intention of step 3 is to try to match the applicant’s need with an existing partner. Where concept notes are matched in full (i.e. all elements of the requested supported matched by an INTOSAI regional body or in-country donor), steps 5 and 6 will be omitted. Where concept notes are partly matched, the concept note will be adjusted to reflect this, before being finalised for sharing with potential donors and other providers of support. 5.Applicant submits final concept note: at the end of the cyclical process involved in steps 1-3, the Secretariat confirms to the applicant that the concept note is considered finalised. It can then be uploaded to the SAI Capacity Development Database by the applicant, and are checked and published by the Secretariat. 6.Circulation of concept notes: Upon finalisation, concept notes are shared immediately with all members and observers of the INTOSAI-Donor Steering Committee. In addition, all concept notes finalised each quarter is circulated as a batch to Steering Committee members. Steering Committee members will be prompted to share concept notes within their organisations, to ensure the widest possible dissemination. 7.Initial expression of interest: on an ongoing basis, all donors and other potential providers of support inform the Secretariat about their interest in supporting concept notes. The Secretariat tracks interest in each concept note and facilitates contact between the applicant and all those interested in providing support. 8.Project development: applicants work directly with donors and other providers of support to develop concept notes into appropriate proposals for funding and implementation. The support from the Secretariat in this step is limited, on an exceptions basis. Based on these documents, prepare a concept note for your organization and e-mail it us, along with any relevant documents, at intosai.donor.cooperation@idi.no. You will hear from us soon after! What’s New in Tier 1? Rolling process: concept notes can be submitted at any time, rather than in set time windows. So SAIs can apply when they are ready, and when best fits in with their strategic cycles. SAIs can also make use of the information on funding sources, including donor factsheets, to identify the priorities and funding cycles of potential donors and other providers of support. This may enable SAIs to apply in time for specific donors to consider their applications when developing their country strategies. Stronger quality checks: concept notes are reviewed against agreed INTOSAI-Donor core principles, and only circulated once these are met. These include: SAI-led not donor driven; linked to the SAIs strategic plan; and harmonised and coordinated with existing support to avoid overlap and confusion. Improved coordination: with existing providers of support and INTOSAI regions. Draft concept notes are shared at an early stage with those already supporting the SAI to see if the proposal can be incorporated into an existing or planned project. Concept notes are also shared with the relevant INTOSAI regional body to see if the needs can be met through a current or planned regional program. Concept notes which cannot be met in this way will then be shared with the members of the INTOSAI-Donor Cooperation to identify interest in the provision of support.